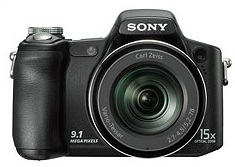 The Sony Cybershot DSC-H50 is a 9.1 megapixel full featured point and shoot digital camera (announced 25 February 2008). The DSC-H50 features a 15x Optical zoom lens (31mm – 465mm equivalent), 3.0 inch flip-up LCD display, ISO range of 80 – 3200, 15 MB of internal memory and a 9 point autofocus system. The Sony DSC H-50 includes Smile Shutter technology which captures smile the moment they happen, as well as Face Detection technology to optimize focus, exposure and color for up to eight faces. Sony today announced the latest addition to its high-zoom camera line, the 9.1-megapixel Cyber-shot® DSC-H50 digital camera. It is the ideal choice for people looking for high zoom, high-resolution and speed. This new model utilizes a powerful Carl Zeiss® 15x optical zoom lens with Super SteadyShot® optical image stabilization to capture action at a distance. One of the main lens elements is manufactured from super low-dispersion glass, which helps it produce more exact point-to-point correspondence between an object and its image. The lens yields sharp, high-contrast images and reduces color fringing, even when shooting in telephoto ranges. Its improved “advanced sports” shooting mode now employs a system to apply higher shutter speeds, up to 1/4000 of a second, more frequently than on previous models. This mode combines high shutter speeds with predictive continuous auto-focusing so you can quickly focus and capture fast-moving subjects with minimal shutter lag basically the time it takes for the camera to focus and shoot. Other helpful features include a new D-Range Optimizer (DRO) plus mode that applies a high image correction algorithm to retrieve more picture detail in bright highlights and dark shadows; NightShot® technology to help capture photos in virtually no light as well as infrared remote access; five color modes including “real” for less in-camera processing and more faithful color reproduction; in-camera editing features; advanced in-camera image management functions; improved slide show functions with longer music files; and HD component output for viewing photos on a compatible HDTV set. The H50 model will soon sit at the top of the Cyber-shot high zoom line. It will ship in May for about $400 with a full line of accessory options. All can be purchased online at www.sonystyle.com, at Sony Style® retail stores, at military base exchanges and at authorized dealers nationwide.